Captivating, free form embroidery by iHanna, a.k.a. Hanna Andersson, 2011. I created this embroidery for a challenge with the theme “captivating” (fängslande). I got my idea rather late and only had a week to stitch this up, but I worked on in it every day. In someone’s car on my way to a meeting, on the train to work, in bed… I finished it in time for the deadline and was very pleased with myself. I love when a deadline helps push me to do creative work even when I’m tired and doubtful of my abilities. A lit candle (and any open fire or flame) is very captivating, don’t you think? We are fascinated by fire because we need(ed) it on that basic level of warmth, light and for cooking. But of course, my embroidery has double meaning since the image is based on the logo of Amnesty International, an organization that tries to help people in captivity. To me it’s political and a very strong symbol. On another note, but still with embroidery on my mind, I can not believe that it’s been over a year since I finished my embroidery series Fly photo of an inner landscape (consisting of Inner Landscape I, II, and III). I loved working on those mixed media embroidery pieces so much! I was happy with how they came out and even sold one… I wanted to continue to work in this style and let it evolve, and I’ve thought about starting anew many times… But I have stopped myself, felt the fear of success (and the terror of failure) and thought things like: what if it’s not as good as the previous ones? what if it’s nothing like those? and worse: what if I just make an ugly copy? is that really what I want? I stopped and thought: I don’t actually know what I want to create and hoped to find out by thinking about it. I’ve also made plans in my head, tried to visualize what I want and thought about what materials I need to get… It’s called being stuck in your head/procrastination. I see it now, and I feel stupid for doing this to myself. The truth is of course, I need to start something, anything. And actually I do have a new idea I want to try. I don’t need any new material to try it out, and I don’t need to sketch it, feel ready for it or clean my desk once again. I, as do you, need to get going with my creative work. I wove to take action as soon as possible. 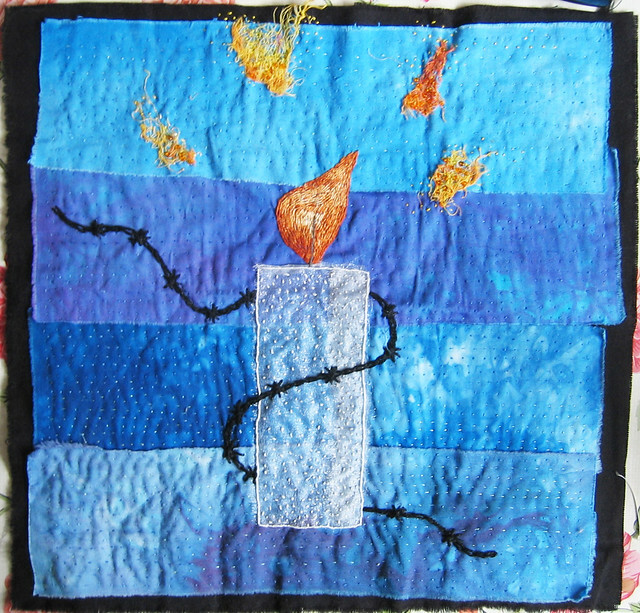 This entry was posted in Fabric Art and tagged broderiakademin, candles, embroidery. Bookmark the permalink. go girl, you can do it. happy holidays. The candle is lovely. Just launch yourself on your next project – your embroideries are always so gorgeous. I love your candle embroidery….. and how you snatched every possible moment to work on it. It is a very strong image that works very well. ps your pink fairy lights are SO sweet! I can see why you will be keeping them up!!!! Thank you for sharing, Hanna. Stopped by to check up and see what wonderful, creative things you were up to and to say thank you for the wonderful posts over the past year. You help keep me energized and inspired. Thanks for all you do and have a great holiday season and an exciting new year.